What are the biggest beneﬁts creating TRUST and FLOW? To Achieve Breakthrough in Productivity and Results we use Talent Dynamics (TD) which is a Business Development System to Increase Trust, Flow, Productivity and Results for individuals, Teams and Companies/Organizations. It is using individual profiling to assess the TEAM Dynamics. “Focus on your strengths, not your weaknesses” and Increase Trust, Flow, Productivity and Results. 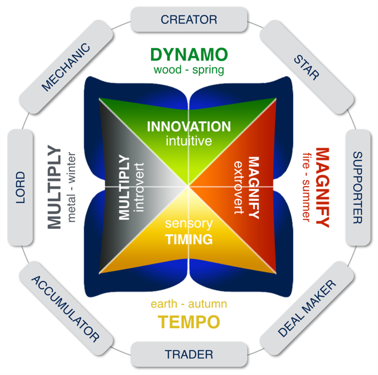 Within the Talent Dynamics Square(see below), there are two opposites of how value is created (Innovation and Timing). There are also two opposites of Leverage. Leverage is the driver of profitable growth, and comes from an understanding of how to always achieve more with less. Within Talent Dynamics, growth is achieved through leverage, and leverage (Magnify or Multiply) is measured through Flow. 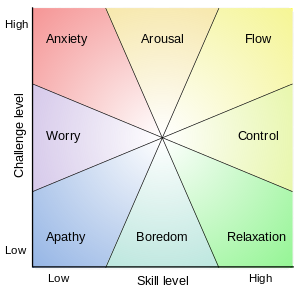 There are 8 Talent Dynamics profiles and there are different areas in which we provide flow to others, and in which we are most in danger of blocking flow. For example, a Creator will add flow to the creative process, but is the most likely to cause a block in the flow of timely execution. Too often, teams and companies have paths of flow to get things done that are far from optimal, as they navigate around individuals or even entire departments that others have found to block flow. With Talent Dynamics, these paths can be unblocked and realigned with radical changes in efficiencies, productivity and measurable growth in revenue and profit. People in Flow are 5X more productive!! Some of us act more through people and are more extrovert. For extroverts the natural way to leverage is to magnify. Some of us act more through data, and are more introvert. For introverts the natural way to leverage is to multiply. The eight profiles fit around the square, each with a different balance of how they most naturally think and act. You will find that everyone has a profile and a natural path to success. People in Flow are 5X more productive. Let’s first analyse what we need based on the above Trust and simplified Flow explanations: If a person has a challenge, is trusted, has the right skills and likes the challenge even if the challenge is big there will be tremendous motivation, competence and enjoyment to pursue the challenge and succeed. In other words when you are trusted, know what you are good at and what you love to do you can reorganize your time and activities to focus on what you love most and do best. You know also what to say No as well. When you do this, your fulﬁllment and effectiveness goes up, and your stress and struggle goes down. Of course many people will say but I cannot determine what I need to do at work and this is a valid argument why people do not reach flow. How can we change that? In fact the answer is simple: If the principles of Trust and Flow are applied to a number of individuals working together as a TEAM then we can reallocate the various activities to the right person and by supporting each other we can bring the whole Team in Flow. To do that we only need to know the individual profiles (strengths, challenges and best roles in a team context) of all the Team members. Can you imagine if we could create Flow in the work place? The productivity and results will skyrocket. Having high performing teams is the key to scaling your business. Building or optimizing the right teams, with the right people in the right place begins by knowing yourself and then your team. In fact achieving Flow on individual level it does not need to be 100% for all activities. Even if we achieve Flow 50-60 % of the time the productivity will skyrocket. Of course increasing the Flow is decreasing the stress and this generates not only great business results but also more healthy/satisfied individuals, fun in the working environment and a better society at large. With the massive changes on going in the 21st century where Labor, Information and Money are moving easily and fast having motivated individuals and high performing teams will be the most important competitive advantage. 5.Identify and generate ideas for business development which are sustainable, scalable and attractive for future development. 2.Ensure people in the Team know their strengths and best roles in life. 3.Ensure people understand well others in the team. Everything starts with knowing yourself and others. 5. Identify and address any blocks. 7.Ensure people understand each other’s challenges or successes by being curious, open minded and sharing stories/examples to explain their challenges & successes as well as learn from each other. 8.Understand well the shared vision, objectives/goals and work together in multifunctional teams to create a strategy and action plan to deliver the results.